Create Your Yearbooks The Easy Way! You helped shape their future, now remind them where their stories started. Leavers’ Books does the hard work! 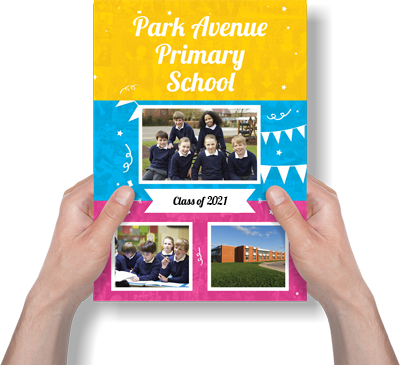 Creating school yearbooks is the perfect way to say goodbye to your pupils leaving this year. With Leavers’ Books, you’ll capture wonderful memories your pupils have experienced. We manage your printing, in house quality control and delivery service to make your life easy! There’s nothing more precious than seeing a child’s face light up with excitement. And with a yearbook from Leavers’ Books, they will continue to do that every time they open their yearbook. With plenty of yearbook designs to choose from, there’s one perfect for every school! Our professionally designed yearbook page templates help to create your yearbooks easily! Getting started on your yearbooks couldn’t be easier… all you need to do is Sign up for a free account and start creating! You will have access to our yearbook creator to make the perfect yearbooks for your leavers! If you would rather see what we can do for you first, why not Request a Free Sample from us? It’s a great way for you to see example yearbooks and the templates we offer when using our yearbook service. The most popular option for creating yearbooks. With our super simple online yearbook creator you can make yearbooks quickly and with ease. The online creator gives you full control over your yearbook design, and with over 65 yearbook templates to choose from you will certainly find something to suit you. Yearbooks are fantastic, and pupils love them, but we understand that sometimes you just don’t have the time to put them together. This is why we offer a completely free, professionally designed yearbook service. Simply upload your images and text via our secure cloud.